An experimental Liverpool side won at Bournemouth to record a third consecutive victory in all competitions. Roberto Firmino's rebound and Daniel Sturridge's header gave the visitors a commanding 2-0 lead at half-time. Bournemouth rallied after the break but Joshua King's stoppage-time strike came too late for a comeback. The result lifts Liverpool up to eighth place in the Premier League table, while the Cherries remain 13th. Liverpool made 10 changes from Thursday's momentous Europa League win over Borussia Dortmund as manager Jurgen Klopp named an inexperienced side. The fringe players repaid the German's faith with an accomplished performance which preserved their record of having never lost against Bournemouth. Liverpool still have a slim hope of finishing in the top four but winning the Europa League is their likeliest route to Champions League qualification - and Klopp's selection suggested he agrees. Wales goalkeeper Danny Ward made his club debut and young defender Connor Randall was given a first Premier League start. Jordon Ibe and his fellow winger, the less experienced Sheyi Ojo, shone as the Reds' youngsters seized control of the first half. However, it was two established first-team players who made the most telling contributions. Top scorer Firmino opened the scoring from a rebound after Artur Boruc had saved Sturridge's audacious backheel, before the England striker headed in Ibe's free-kick just before half-time. A European hangover is an ailment which has undermined Liverpool's Premier League campaign. Their victory against Stoke on 10 April was only the second time in eight attempts that Klopp's side had won after a Europa League fixture this season. However, this mature display suggests the Reds are capable of finishing the campaign strongly on both fronts. With six games left in the Premier League, Klopp now faces a balancing act between Liverpool's domestic commitments and a Europa League semi-final against Villarreal. Given Leicester's extraordinary title challenge, Bournemouth's first Premier League campaign has somewhat passed under the radar. A run of four wins from their previous six games had Eddie Howe's side targeting a top-half finish, though this defeat is a setback to those hopes. 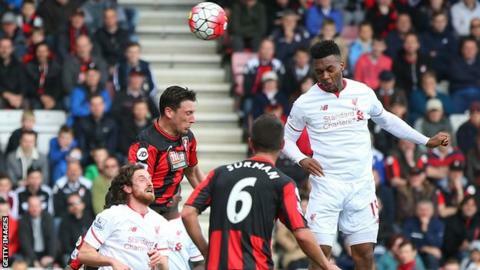 Bournemouth were competitive throughout against Liverpool, testing Ward on numerous occasions in the second half. Their perseverance was rewarded with King's low strike in added time, even if the goal was ultimately in vain. Liverpool's young winger (left) was a constant threat, linking well with his team-mates and providing the assists for both goals. Liverpool manager Jurgen Klopp told BBC Sport: "They've never played together. They could have defended better, played a bit more football in the first half - but it was really, really good. "Danny Ward was brilliant. Let the self-confidence grow of goalkeepers, they're normal human beings." Bournemouth boss Eddie Howe: "The goal came too late for us. We felt in the second half had we got that goal earlier it would have made an interesting end to the game. "We were missing that spark, especially in the first half. You have to give Liverpool credit." Liverpool have now won away at 50 different grounds in the Premier League, more than any other side. Roberto Firmino has been involved in 12 goals in his past 11 Premier League games (8 goals, 4 assists). Daniel Sturridge has scored in each of his past three away league games. Joshua King has scored four goals in his past six Premier League games for Bournemouth. The Reds have scored at least twice in five of their past six league games away from home, failing to score in the other. Match ends, Bournemouth 1, Liverpool 2. Second Half ends, Bournemouth 1, Liverpool 2. Attempt missed. Steve Cook (Bournemouth) header from the centre of the box is just a bit too high. Assisted by Marc Pugh with a cross. Goal! Bournemouth 1, Liverpool 2. Joshua King (Bournemouth) right footed shot from the centre of the box to the bottom left corner. Assisted by Andrew Surman. Attempt blocked. Callum Wilson (Bournemouth) header from the centre of the box is blocked. Attempt missed. Steve Cook (Bournemouth) header from the centre of the box misses to the right. Assisted by Charlie Daniels with a cross following a corner. Corner, Bournemouth. Conceded by Lucas Leiva. Corner, Liverpool. Conceded by Artur Boruc. Attempt blocked. Divock Origi (Liverpool) right footed shot from outside the box is blocked. Assisted by Sheyi Ojo. Attempt missed. Daniel Sturridge (Liverpool) right footed shot from the centre of the box is too high. Assisted by Adam Lallana. Attempt blocked. Joshua King (Bournemouth) right footed shot from outside the box is blocked. Assisted by Andrew Surman. Daniel Sturridge (Liverpool) hits the left post with a left footed shot from the left side of the box. Assisted by Adam Lallana. Corner, Bournemouth. Conceded by Danny Ward. Attempt saved. Lewis Grabban (Bournemouth) header from the centre of the box is saved in the bottom right corner. Assisted by Simon Francis with a cross. Attempt blocked. Lewis Grabban (Bournemouth) left footed shot from outside the box is blocked. Assisted by Dan Gosling. Attempt blocked. Lewis Grabban (Bournemouth) left footed shot from outside the box is blocked. Attempt blocked. Joshua King (Bournemouth) right footed shot from the centre of the box is blocked. Assisted by Charlie Daniels with a cross. Substitution, Liverpool. Adam Lallana replaces Jordon Ibe. Substitution, Bournemouth. Callum Wilson replaces Matt Ritchie. Attempt missed. Daniel Sturridge (Liverpool) left footed shot from more than 35 yards misses to the left. Assisted by Jordon Ibe. Attempt missed. Matt Ritchie (Bournemouth) header from the centre of the box is close, but misses the top left corner. Assisted by Simon Francis with a cross. Attempt blocked. Joshua King (Bournemouth) right footed shot from the right side of the box is blocked. Assisted by Artur Boruc. Substitution, Liverpool. Mamadou Sakho replaces Kolo Touré. Kevin Stewart (Liverpool) wins a free kick in the defensive half. Attempt saved. Joshua King (Bournemouth) left footed shot from the right side of the box is saved in the centre of the goal. Assisted by Marc Pugh. Offside, Liverpool. Joe Allen tries a through ball, but Daniel Sturridge is caught offside. Offside, Bournemouth. Simon Francis tries a through ball, but Steve Cook is caught offside. Corner, Bournemouth. Conceded by Kevin Stewart.